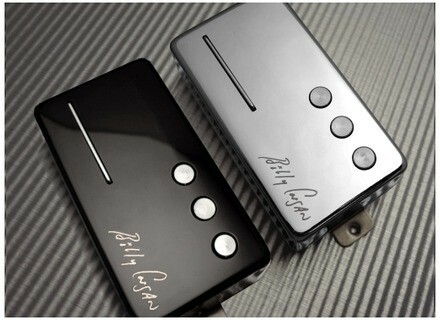 Billy Corgan Signature - Bridge, P90 guitar pickup from Railhammer in the Humcutter Series series. Railhammer presents the Billy Corgan Signature pickups, a series of two different pickup models (neck and bridge) for electric guitars. Presented last January at the NAMM as part of the new Reverend BC-1 Billy Corgan Signature guitar, Railhammer's Billy Corgan Signature pickups will also be available on their own as part of the brand's Humcutter Series. According to the manufacturer, the Neck version is based on the classic vintage P90 output and tone, but adds a slight treble bump, giving it a more open treble chime and extra articulation (plus, as a humbucker, it's of course hum-free). As for the Bridge pickup, it claims to combine the clarity and articulation of a P90 with the thick tone and low noise of a humbucker. Announced as versatile, both models were elaborated in collaboration with Corgan and combine rails (to tighten the tone of the wound strings) and poles (to fatten that of the plain ones) - a combination aimed at enhancing the overall tonal balance. Available finishes include silver and black, and MSRP is $109 for either of the Neck and Bridge models. More details available at Railhammer's website. Top Brands for Electric Guitar Strings Every guitarist needs strings, and lots of them, so choosing the right type is important. Despite their seeming simplicity, these metallic threads can guarantee tuning stability, long-term durability and a matching sound for the guitar. We polled 1,223 members of the French version of Audiofanzine to come up with these rankings, and we thought we'd pass the results on to you. We'd love to know which string brand is your favorite, so please use the comments section to let us know! Bare Knuckle release Impulse signature humbucker Bare Knuckle launch their first new product of 2016, the Impulse signature humbucker created with Josh Smith from Australian metalcore band Northlane. ZVex presents Candela Vibrophase For those who consider using tubes in guitar effects is still not vintage enough, ZVex has come up with a new concept: candle-powered effects.